Fusion of data from multiple sensors can enable robust navigation in varied environments.However, for optimal performance, the sensors must be calibrated relative to one another. Full sensor-to-sensor calibration is a spatiotemporal problem: we require an accurate estimate of the relative timing of measurements for each pair of sensors, in addition to the 6-DOF sensor-to-sensor transform. In this paper, we examine the problem of determining the time delays between multiple proprioceptive and exteroceptive sensor data streams. The primary difficultly is that the correspondences between measurements from different sensors are unknown, and hence the delays cannot be computed directly. We instead formulate temporal calibration as a registration task. Our algorithm operates by aligning curves in a three-dimensional orientation space, and, as such, can be considered as a variant of Iterative Closest Point (ICP). 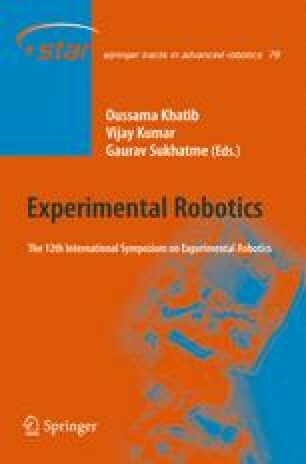 We present results from simulation studies and from experiments with a PR2 robot, which demonstrate accurate calibration of the time delays between measurements from multiple, heterogeneous sensors.